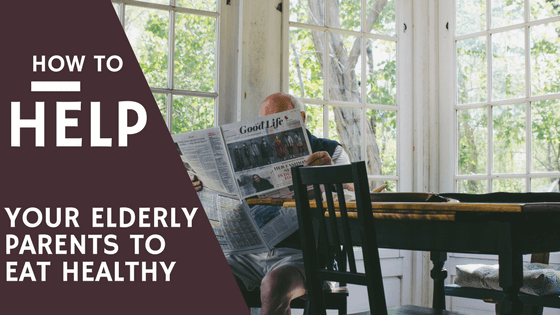 Are You Worried Your Elderly Parent Doesn’t Eat Enough? Has your elderly parent lost interest in food? She complains that nothing tastes right anymore and she just doesn’t feel up to cooking. When you ask, she can’t remember what she had for dinner last night. When you check on your dad you notice that his fridge has only a couple cans of ginger ale and a stale loaf of bread? But on his counter is a half finished bag of Oreos? This isn’t how your parents taught you to eat! You can see that your mom is becoming weaker and not able to keep up with her usual activities. Your dad complains of stomach pain and being tired all the time. You want to encourage your parent to eat healthier but you don’t know where to start. And you don’t want to upset them. Did you know your parent’s nutritional needs will be different now than they were 15 years ago? It’s okay. You don’t have to try and make your mom eat a full dinner like she once did. But you also know that nutrition is vital for health, a long life and Dad being able to enjoy his golden years. Up to 1/3 of seniors admitted to the hospital are suffering from malnourishment. It breaks your heart to see your parents not having their food needs met. But what can you do? You can understand the changes that happen as your parent’s age and try a few new strategies to make sure that each bite counts. Can you remember a time when your Dad used to devour a full dinner and then finish your half empty plate? Appetite, the amount of food you need to eat and how you respond to food will change as you age. You know when you walk past a bakery and the smell of fresh bread makes your stomach growl? Your sense of smell triggers your desire to eat. Over 75% of people over the age of 80 report having a decreased sense of smell. If you can’t smell your food, the taste will also be missing. Where is the enjoyment in food if you can’t taste it! Talk with your parent’s doctor about testing for a loss of smell. Bump up the flavor and aroma of the food! Opening a can of soup or re-heating a frozen meal will not trigger Mom’s interest in food. But a pot of soup simmering in a crock-pot for the day releasing a delicious, tantalizing smell can draw her interest. Or a loaf of fresh bread baking in the oven. Who can resist a slice of warm bread with butter and jam? Often an elderly person will rely on added salt and sugar to flavor their food. But the addition of herbs, healthy fats and slow-cooked simmered foods are a healthier alternative. A 16 week study in a senior’s home found that adding flavor enhancers to cooked meals resulted in an increase in body weight, daily intake, increased hunger between meals and satisfaction with food. Healthy eating is less about the amount of food you eat and more about the type of food you eat. Your mom or dad most likely has a small appetite at this stage. That is normal. This is caused by a quieter life with fewer physical demands as well as a decreased ability to digest large meals. You can work with that. Aim to provide meals that are high in nutrition and small in amount. Look for ways that you can add these powerhouse nutrients to your parent’s diet. Even a small increase in antioxidants, healthy fat, vitamins, minerals and probiotics will drastically improve your health! Antioxidants are the powerhouse that help the body to protect and repair itself. In France a 2 year study reported that an increase in dietary antioxidants resulted in a longer life span and a higher quality of life. If you set a small bowl of fresh, juicy blueberries on the table while you sit and visit with Mom, you will be surprised how quickly they disappear. Adding healthy fats to your parent’s food adds delightful taste and flavor. Don’t forget nuts and seeds are high in fiber which promotes bowel regularity. Another concern as they age! All the essential vitamins and minerals your parent needs can be found in natural, unprocessed foods. Processed foods use high amounts of sugar and salt to replace the natural flavor our bodies crave. Most of the nutrition Mom needs to continue to live her life well can be found in these foods. Dark leafy greens are high in vitamins A, C, E and K as well as B-complex vitamins. Not to mention fiber, iron, magnesium, potassium and calcium. Doesn’t that sound like a multi-vitamin? Mom was right! You need to eat your vegetables to be healthy. You have permission to (gently) remind her of that and serve her up a serving of sautéed spinach. Or add a little kale to a fruit smoothie. You might have to be sneaky to get those extra greens into Dad! Protein continues to be an important building block in a healthy diet for the elderly. Adequate amounts of protein help older adults to increase and then keep the muscle mass that is vital for physical functioning. You’re not dead yet! Remind Mom and Dad that their body still uses protein to keep their muscles strong. Muscles they need to get out of the chair, walk around the block, shower themselves or drive a car. Meat continues to contain the highest source of protein. But chewing a steak is difficult for your elderly parent. Try instead to include moderate amounts of red meat that has been slow cooked in a sauce for a soft and tender source of protein. All this valuable nutrition is neatly packaged in a shell and makes for a quick, easy breakfast, lunch or dinner meal. Try offering a hard boiled egg served with half a cup of cooked veggies for a filling but small lunch. The small size of an egg is the ideal serving size for Mom when her appetite is low but her nutrition needs are high! Not only are probiotic food rich in health benefits and help with digestion but they also contain a complex, strong flavor that can help your parent want to eat more. Food is such an amazing gift! Here are a few ideas of meals and snacks to make for your parent to increase the amount of healthy food they eat. Yogurt mixed with nuts, seeds or fruit. If your parent finds chewing nuts uncomfortable, try blending in a blender for a smoother snack. Power smoothie! Yogurt or kefir mixed with berries, a handful of leafy greens, coconut oil and a scoop of high quality protein powder. Homemade soup including fresh broth, hearty veggies and healthy fat. Like a creamy Broccoli soup. Or a colorful, nostalgic Red Cabbage soup, just like Grandma once made. Chunky but soft stew that simmers chunks of beef, onion, carrots, cabbage in a homemade beef broth. Leave this in a crock pot for the day and all those taste buds will be firing by supper! Custard: the forgotten and nourishing treat of years past! Flavor with honey or fresh fruit. Remember with all these meal ideas to focus on providing foods with high nutritional value but in small amounts. Even if it is just ½ a cup of soup, a 4 ounce smoothie, 1 poached egg. Although your parent may only eat small amounts, each bite can add value to their life. Are you thinking “how am I supposed to make all these homemade meals for my Mom?” You might be thinking you don’t have time for cooking. That’s okay. The secret to improved nutrition is the family meal. Remember how Mom and Dad used to insist that you all sit down together for breakfast and dinner? That’s because they knew what they were talking about. A loss of interest in food is often connected to depression and eating alone. Food is meant to draw us together with the ones we love. I know you are busy and have a lot on your plate taking care of your elderly parent. It can be a full time job! But what if instead of rushing to appointments and on errands you were able to set aside 3 hours to nourish your parent. It doesn’t have to be everyday but try to be regular and consistent. Sit in the kitchen together and chop vegetables while you visit. Together put on a big pot of soup full of veggies and love. Let it sit and simmer while you head out to the necessary doctor appointments. But come back and sit at the table with your mom or dad. Maybe you can Skype in a sibling or grandchild. Smell the poignant fragrance of the soup, dish up a small bowl for each of you and sit together. You might be surprised at how this will change your parent’s appetite. Pack the rest of the soup in to small, re-heatable containers and leave them in the freezer for Mom to eat until you come back next time. Eating together is the simple, yet vital, ingredient to healthier eating. Nutrition is a valid concern when you are taking care of your elderly parent. You know they need to eat better but you don’t know how to make them do what they are told! The key is to not force the issue. Your role in supporting your parent to eat well is to provide healthy, nutrition rich foods in smaller amounts. But more important to see meals as what they are meant to be: a time and place for families to eat together. This is true regardless of our ages. Eating alone leads to loss of appetite, depression and loneliness. The startling benefit is that preparing nutritious food with your parent and eating with them will help you too. It doesn’t have to involve fancy dinners! Try just one small change. A small smoothie. Soup once a month. But more importantly what will you gain from the hours you will spend sitting and eating with your mom or dad?